0. Fist off, I have a desktop connected to the router through an Ethernet cable. I do not experience any connectivity issues here, it is my daily workstation and I use it a lot. Issues are restricted to wireless devices. 1. When I connect a device to WiFi, sometimes I get a pop up that my password is incorrect. I re-enter the same password and get sometimes connected, sometimes not. There is no other WiFi with the same SSID in the neighborhood. This behavior happens on a Razer laptop, iPhone and iPad, so not restricted to 1 device. 2. When connected to WiFi, the device gets no ip. I have partially resolved this issue by disabling IPV6 in the advanced internet settings (Local connectivity only). Also enabling always broadcast DHCP seemed to help. I did not require these settings for 1 month and everything was working on all devices, so it is strange. While I get up problem 3 persists. 3. When connected to WiFi and with IP obtained through DHCP, I sometimes loose internet connectivity. This happens only on WiFi connected devices. When this happens I try to reconnect to WiFI and get to problem 1. I live in a busy area with many apartments, however I am sure there is no other WiFi using same SSID. My worry is that everything worked fine initially and now the issues occur on various wireless clients and a HW reset does not help. Any help to resolve these issues would be greatly appreciated. Was the router working before any firmware updates? What FW was loaded prior to updating? Try setting Medium or Low power output settings and test again Under Advanced/Advanced Wireless. Link> >FW Update ProcessFirmware not updated. Was the router working before any firmware updates? Which version had been loaded prior? Yes. Was working great for a month. Gigabit 1000Mbit glassfiber modem. Ethernet output with DHCP. Works great without router. Link>Finding Faster DNS Addresses using Name Bench and input new DNS addresses under Setup/Internet/Manual. Using Comodo and OpenVPN DNS after testing. Done. 2.4 = G/N 5 Ghz 1 is G only, 5 Ghz 2 is AC only. No. No more than usual. Try setting Medium or Low power output settings and test again. Thank you very much four comments. I have done everything you mentioned and have been testing for the last two days. I am experiencing the same issues on all G, N and AC devices. The router disconnects wireless clients at random and says that password is wrong when reconnecting. Even if it is right. After 4-5 times reconnecting it works. Sometimes clients have no internet access even after connecting. What worries me is that everything worked great for a month, then everything stopped. There were no changes or FW updates to the router. Also, wired clients are working ok.
What are the wired speed tests with a wired PC connected to the ISP modem and then thru the DIR router? My download speed is 430Mbps and up is 500Mbps wired through DIR router. Wired clients work great with the DIR router since the beginning. Sometimes clients have no internet access even after connecting. After more testing: No internet issue occurs to only clients connected through 2.4Ghz SSID (currently set to g/n mixed Auto 20/40). Wrong password 4-5 times and sometime disconnect issues occur on all three SSIDs. So what channels are you using now on the DIR router? Is the wifi working any better since making any changes? FurryNutz, I am very grateful for all the tips and debugging you are providing. I have learned a few new tricks along the way like setting up custom DNS to speed up the internet using your guidance. However, I must say: Given the amount of time I have spent debugging the D-LINK flagship DIR-895L issues, my opinion is that it does not justify its price range. I am disappointed with this top of the shelf D-LINK product. Tested on iPhone 5c, iPhone X, Mac Book Pro 2015, Razer Blade 2018 laptop connected through wireless and desktop connected through ethernet to DIR. Can't connect: When connecting I get 4-5 times wrong password response after that connection is made. Can't access router config:I get an IP 192.168.0.x on all devices I tried. If I try to open the router page on 192.168.0.1 the page keeps loading and I get a timeout. I can however, ping the router on 192.168.0.1. Can't access internet:Same issue as above, page keeps loading I get timeout. At the same time my desktop PC connected through ethernet is working fine. Works ok: All clients can connect, I get 200Mbps up and down roughly. Disconnect on first page request: Devices connect ok. 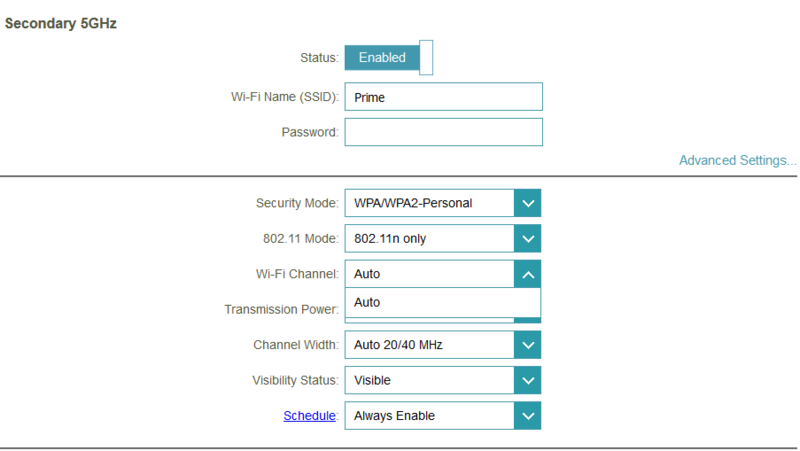 If I open router config page or any web page the wifi disconnects immediately. This happens 4-5 times. If connected low speed: If the wifi does not disconnect on first page request I get 50Mbps up and down. I tried on all abovementioned devices and various places around the house (including infront of the router). My suspicion is that something broke inside the router. I have started an support ticket with D-LINK and hoping to RMA the router. I am not sure if this will be accepted since it is more than 30 days since I purchased DIR-895L. I will await D-LINKs response and then decide what course of action to follow. If you have any more suggestions please let me know, thanks again! What iOS versions are on the Apple devices. What OS are you using on the Blade laptop? What is the Mfr and model# of the wireless adapter attached to the laptop? 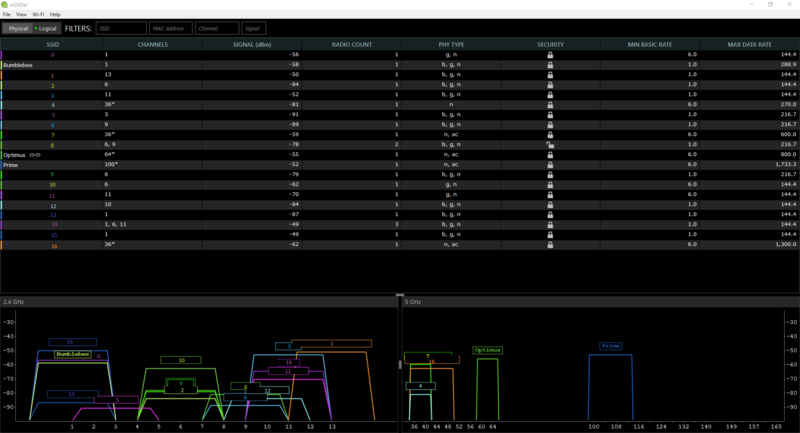 Your 2.4Ghz surroundings is kind of noisy. Can you test channel 13 please? Please try channel 48. Also try AC mode only then try N and AC mixed mode. Revert back if this fails. Channel 100 is a DFS channel, possible incompatibility here. Please try channel 149 or 165. Also try N mode only then try N and AC mixed mode. Switched to AC only and channel 48. iPhone X 200 Mbps up/down, Razer laptop 180 Mbps down 250 Mbps up. I will test with mixed N and AC tonight. 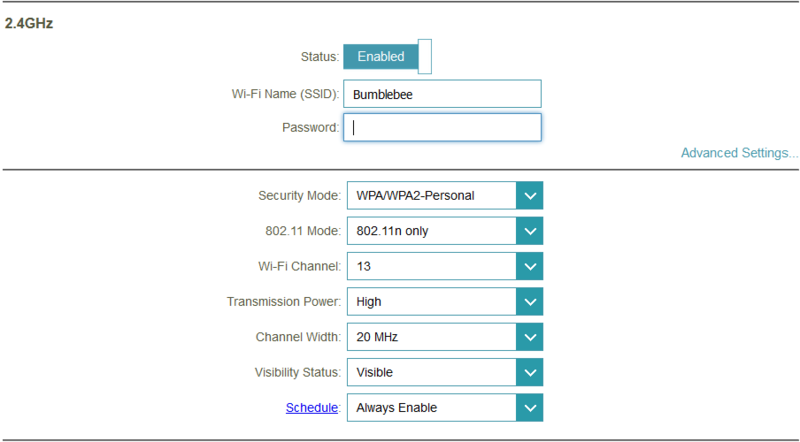 Try a quick test, disable WPA on 2.4Ghz and 5.2 radio. Does any of the devices connect with out problems? Re-enable WPA2 after testing. Set 20/40Mhz on 2.4Ghz with channel 13 as well. iPhone X connects, won't get ip through DHCP. Razer laptop connects, gets ip, timeout on router config page or another website. Sounds like you might have a bad unit. I recommend that you phone contact your regional D-Link support office and ask for help and information regarding this. Ask about an RMA. I have just received a replacement unit from D-Link RMA and set it up exactly as above with Smartconnect disabled. Everything works great on all devices and all networks. On AC only network I get about 440 Mbps up and down. Thank you again for the troubleshoot! Glad the RMA unit works. Enjoy.